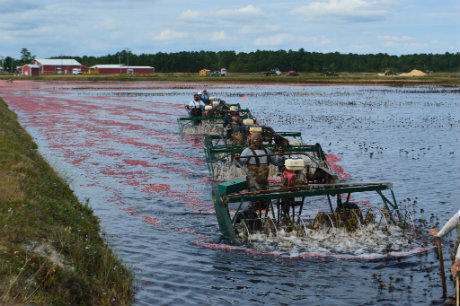 Cranberry harvesting spans across seven parts of North America and down in Lanco, Chile. One of those regions – the furthest south they’re propagated in the United States is New Jersey, which is wrapping up their season in about a week. It’s said that industrial cultivation of the fruit began in the state in the 1840s. Last year was a record crop year for Pine Island Cranberry Company, but Stefanie Haines says they’ll know for sure once all of the numbers are totaled for this season if it will be markedly different. Their berries are grown on 1,400 acres and are bought and marketed by Ocean Spray. She says this year was fair, but that the weather could have cooperated better. “It’s been a little bit slow because of the warm weather. Cranberries require colder weather in order to get the appropriate color so we’ve had to stretch out the harvest. We started earlier but we had to chase the color a little bit,” she says. 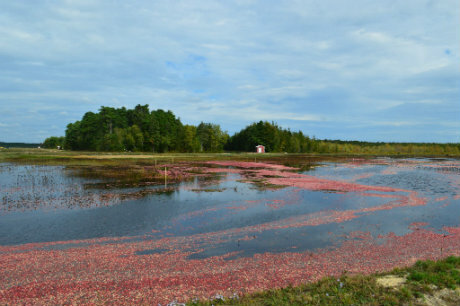 This year the company ran a large renovation program; bogs are being regraded and replaced with newer cranberry varieties in order to increase yield and improve color and disease resistance which meant the running two crews rather than their regular three. Their acreage has remained much the same since 2005 since Haines says there isn’t any more local land available for purchase. Other than limited growth, producing a quality berry is the focus. Their bogs are sanded in segments each year, with each one receiving treatment every four years. This helps weed prevention, eliminating woody growth and strengthen the cranberry plants. Crops were essentially trouble-free, according to Haines, though she says they do have to contend with challenges different than other regions in North America that grow them. “We have a different humidity level than a grower in Wisconsin,” she explains. “We’ve got slightly different challenges as far as diseases but it’s always mostly the weather we have to deal with.” Supplies should be plentiful and the color came in nicely. "I'm not sure our yield totals will be higher than last year, but I think we'll be happy," Haines says.